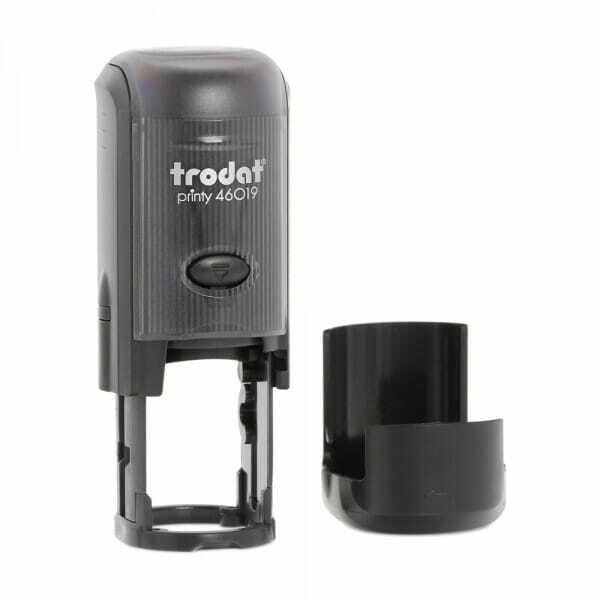 The Trodat Printy 46019 self-inking stamp has a circular impression with a maximum size of 3/4" (19 mm) and allows up to 4 lines of your customized text. A small, lightweight self-inking stamp, which easily fits in your pocket. Ideal for on the move! Perect as as an inspection stamp, or for stamping customer loyalty cards. The Printy 46019 has been ergonomically designed to be able to be used with a minimum of fuss with a single hand. The front of the stamp has an ejection button to make changing the ink pad simple and clean. Compatible replacement pads 6/46019 are available in black, blue, red, green or violet. Replacement pads are supplied in multiple packs of three. Customer evaluation "Trodat Printy 46019 3/4" diam. - up to 4 lines"
Custom Engraved Name Badge- Plastic 1" x 3"
Trodat Ideal Seal Embosser 1" x 2"